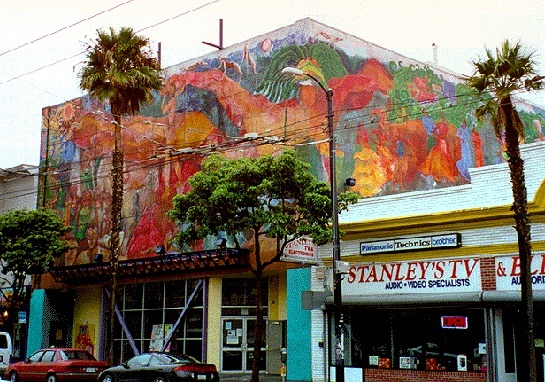 The "Shaft," an old four story furniture store between 24th and 25th on Mission Street, became the Centro Cultural de la Mission in 1977. This photo is from approximately 1996. 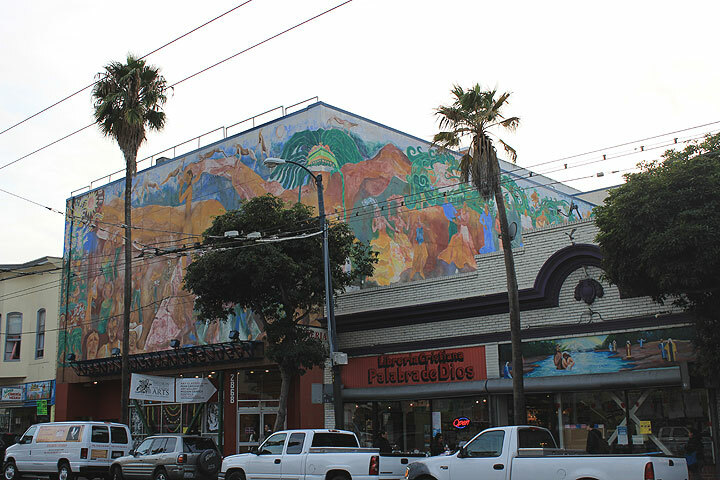 Murals fading, but the building continues to be a dynamic center of local culture, seen here in 2013. "The first meeting was held at St. Peters where representatives from the Arts Commission came down and many community artists attended and spoke up; what we wanted--the big dream to build a pyramid and have ceremonies at the altar. The first scheme was to buy the Armory at 14th and Mission Street and turn that into a cultural center, but it was too big. Some people liked the Armory because it had firing ranges on one floor. There were several groups that submitted proposals for a cultural arts center. One group was led by a reactionary woman on the Arts Commission, Elvira Martinez. She was pushing for an old mortuary building, along with the group from the Palmetto Museum. Other people wanted little sites like the Precita Park Center. We formed a coalition that included everybody in the Mission and said ' No, we want to pick out the spot, we don't want the Palmetto Museum.' At first people thought that that was going to be the cultural center. We said. 'Chale, no, with the mortuary, we want a place for theatre, a place for a gallery and anything that comes with the plan.' We gave them a manifesto." The City gave way to the well organized Alliance and purchased the "Shaft," an old four story furniture store between 24th and 25th on Mission Street. In the Summer of '77 the fifth issue of Tin-Tan celebrated the opening of the Centro Cultural de La Mission, attended by over two thousand Mission residents and inaugurated by featured Nicaraguan poet, Ernesto Cardenal who baptized children at the site. Tin-Tan as well as other Mission publications--El Tecolote, El Pulgarcito and La Gaceta Sandinista--were housed in the third floor. Alejandro "Gato" Murguia was the director of the center--the "Third Form" seemed to be in place. The Mission could now shout louder south of Market Street--a region seen as dangerous, noisy and devoid of literary power and writing culture by the commercial presses of the Bay and the mainstream. La Mission was dressed in full regalia now. The shifting literary currents that once had fostered the Beat Movement in North Beach in the fifties and the Haight Ashbury literary explosion of the sixties were pulsating south of Market Street in the late seventies. The Pocho- Che group immediately began to work on a new series of poetry books by Nina Serrano, Roberto Vargas, and Raul Salinas. They were meeting regularly at Cesar's Latin Palace on Mission and Army (formerly Cesar's Latin Club in North Beach) and at El Señorial, also in the vicinity. Yet, another shout was being heard in the Mission--the increasing military conflicts in Central America, which soon engage many of the Pocho-Che group and various Mission activists and artists in the new Centro and would take the literary missions of the writers to task, to the "fourth form," revolution itself. The following year, in 1978, a bulletin arrived from the Sandinista networks in Central America calling for immediate action and support for the Nicaraguan revolution. People started to leave the centro to actively participate in the Sandinista guerrilla offensive. Gato and Roberto Vargas were invited by the World Peace Council to attend a conference on "Racism and Racial Discrimination" in Basel, Switzerland and a few months later, Gato boarded a plane to Panama to attend a solidarity meeting with Nicaragua representatives. After this he went to Costa Rica and met with Daniel Ortega Saveedra and Victor Tirado Lopez, two principal leaders of the Sandinista Liberation Front (FSLN) and was named as the official Bay Area FSLN representative. At the Centro, Vargas and others had departed and were on their way to Managua. Murguia was left with managing Centro affairs and heading the Nicaraguan and Salvadorean Solidarity Committee; later, he headed to Central America leaving the cultural center in the hands of Alfonso Maciel, a relatively new artist in the Mission. "It was the biggest mistake—how the separation was made. The Centro was turned over to someone who had no political experience and who, in fact, would up being a staunch reactionary who denounced us to the State Department. He wrote in City Arts that the Nicaraguan government had divided the Mission and that he was able to unify it by expelling politics from the Mission Cultural Center." The tropical vision had met its odd end at the highest peak of its development -- the actual participation of Latino Mission poets in Nicaraguan revolutionary practice. By the end of the seventies, the Pocho-Che affiliates went back to their apartments in the Mission wondering what had gone wrong. Everything that they had labored for the last decade seemed to slip away. The Mission Cultural center was hostile territory, their make-shift books and tabloids and presses were out of print, the green tropicalismo wavered and faded. In 1980 Pocho-Che finally disbanded and within a short time, Roberto Vargas moved to Washington D.C. as Nicaragua's cultural attach and Gato went underground in the Mission and co-founded a new group, The Roque Dalton Cultural Brigade, with Magaly Fernandez and colleagues such as Wilfredo Castaño, Jack Hirshman, Jorge Herrera, myself, Francisco X. Alarcon, Victor Martinez and Tina Alvarez. The Pocho-Che poets had accomplished much. What new missions would rise from the ashes? excerpted from "Riffs on Mission District Raza Writers," in Reclaiming San Francisco: History, Politics, Culture City Lights Books, San Francisco, CA, 1998. The new tropical mission begins with the image of a palm tree as it sways over Alejandro Murgía's apartment. "Gato" Murguia, publishes "Palms outside my window" in Time to Greeze, the landmark anthology edited by the Mission poets of the Pocho-Che Collective in 1974.
mayna & guacamayo are outside, where an iguana hides in the grass. The palm tree is the radical image, the voice and language that heightens and colors the new vision, the new Latino aesthetic mission — a tropicalization of our lives. A new poetics of political, cultural and literary "greenness" emerges with the new works of the Pocho-Che poets, underscored by Victor Hernandez-Cruz's own book, Tropicalization, published in the same year. The tropical metaphor refracts our world -- tropical peoples stripped of their homelands - purple corduroys, saris, Sonora ranch hats, black shawls, pedal-pushers, sawed of levis pants, catholic pleated dresses, khaki trench coats, flowered muslin tank tops, laundry pressed polyester slacks, maroon turbans, Club jackets, Latino/as, Filipinos, Afro-Americans, Cubans, Asians and Indians. Hindi, Samoan, Tongan, Chicana and Salvadoreña talk, all in a be-bop stream of "green" sounds, neon and elastic, polished, bilingual and re-souled with adolescent first generation speech play, Nicaragüense, Salvadoreño, Guatemalteco, Hondureña, Peruana, Brasileira and Chicana rap. There is a palm tree outside our windows, the Pocho-Che poets seemed to say, we are that green barrio palm, we are that green earth flame star sparkle.